After spending the Sunday morning with lots of fun and laughter. Reyah and Aarohi were pesturing Twinj to have lunch outside. Twinkle tried her best to get Aareyah agree on staying home but when they knew twinkle won’t fall for their attempts to convince her they knew the who can do this and as always both sister’s were on spree to convince their father which they eventually did succeed. Twinkle watched everything with widen eye’s to see how Aareyah tricked Kunj into their talk’s. Who would say this man was a straightforward arrogant lawyer who can read a lairs soul and trick them to spill the truth on their own but when it comes to his own daughter’s he always give up to them and do as they wish. Twinkle sighed helplessly as Kunj agreed to his daughter’s while Aareyah jumped in happiness and showed their tongue to twinkle leaving her mouth wide open while Kunj chuckled seeing the mother-daughter’s bicker like Kids. After Aareyah left the Twinj room. Twinkle stood up with a grumpy face with her hands on her waist and looked at Kunj with glares who was sitting on other side of bed ” Why you have to be this dumb infront of your daughter’s to accept their every demand ? You are spoiling them Kunj “ twinkle huffed. Kunj pulled twinkle by her wrist making her fall on bed and hovered over her ” As if I never played dumb infront of you Mrs Kunj Sarna. Don’t you remember..” Kunj said with a wink pushing her down the lane of college memories. Twinkle blushed remembering how he used to act innocent infront of everyone while he would tease her behind everyone’s back. He has so many shades which only she had experienced. This man was just like reading a new book each day. He could mould himself easily according to situations but she loved about him most was even after suffering so much due to his parent’s he never had complained from his life. He was always there by her side to support her. Twinkle nodded her head in ” No ” at response biting her lower lip blushing a hue of red reminiscing old memories. Kunj’s gaze travelled at her lips , he slightly grazed his thumb on her Lip’s making her let go of her lower lips from between her teeth. They were completely lost in eachother. They looked at eachother with eye’s filled with love and passion. They leaned in and pressed their lip’s against eachother simply loosing themselves in the heat of moment. Their lip’s moulded against eachother as a jigsaw puzzle. After a while when they felt heavy to breath both let go of eachothers Lip’s. Kunj leaned his head against her’s. Their eye’s closed savouring each and every moment they spend together. He nuzzled his face in her neck and left wet kisses on the bare skin available. Twinkle moaned his name like a prayer in ecstasy and caressed his hairs. When he intentionally bit her hard she pulled at the hand full of hairs in pain. He slowly sucked the assaulted part to lessen the pain but left his mark’s behind. After a while assaulting her neck with his sloppy kisses kunj moved a bit apart and layed on his side of her facing his back to the ceiling cuddling twinkle , his face nuzzled in the crook of twinkle’s neck while twinkle wrapped her hands around his waist as if hugging him. Practically he was half lying upon her but that didn’t made her uncomfortable instead she cuddled herself more in his warm embrace. They layed in each other’s embrace in silence for a while before they got up to get ready to take their little munchkin’s out for Lunch. Soon enough Twinj helped Aareyah dress in Twinning pink and white dresses and tied their hair in high ponytails. They looked uber cute. While twinkle got ready in a floral crop top and high waisted peach pant and paired up with a peach long coat. Kunj was dressed in grey sweat shirt paired with black pant and long black coat. Kunj along with twinkle and Aareyah left the villa for Aareyah’s favourite restaurant. They decided to keep a low profile and not take bodyguards with them that would attack unhealthy attention. Due to Kunj’s success his picture would weekly be printed on front pages of magzines and news channels. In a short span of time along with gaining success he had also gained alot of enemies against whom he won the cases that was one of the reason he strictly kept his personal life low profile and barely any people knew about his married life and Aareyah. Not even his colleagues knew about that specially Aareyah. To keep his lifelines safe he would do anything possible. They reached the restaurant. Kunj asked Twinkle to go ahead with Aareyah and make reservations while he would just come after parking his car but trio mother-daughter’s stood outside the restaurant waiting for Kunj. The car parking was made at the back of Resturant to avoid crowd. So it took a little time for Kunj to park. After parking his car he was about to go and join twinkle and Aareyah when he dashed with someone due to which his car keys and phone fell from his hand. He mumbled a sorry to the person and picked his thing’s up which person to dash with him was looking at him with dreamy wide eye’s. Kunj looked upto find Maya. The new intern in his office. ” Hey Ms Khanna. I am sorry I was a little of my mind. I hope I haven’t hurt you “ Kunj said gently but in a professional tone but Maya was to busy staring him to reply. She was head over heels for him at the first sight but more than that his fame and money attracted her more toward’s him. She knew he was son of a business tycoon. She knew the fact that he wasn’t in contact with his parent’s in a long time period but reason was still unclear. Even though if he don’t have his parent’s support he was still rich and wealthy enough for his wife to spend few lakhs in a day and he won’t be effected but what she was dreaming off for was already someone else including him. Other side twinkle and Aareyah were still waiting for Kunj to come. Aareyah were continuously nagging twinkle to go look for Kunj. Twinkle tried her best to hold them back but when they didn’t listen she finally walked with them to look for Kunj. These girls were stubborn just like their father. Once they decide to do something. They would not give up until they make that thing happen. Before Kunj could reply Aareyah shouted from far spotting him as they came at backside of restaurant in attempt of finding her. They left twinkle’s hand and ran toward’s Kunj almost bumping into him. ” Papa “ Aareyah started but stopped as they saw a little angry and immediately understood their mistake. ” Papa Reyah/Aaru ran first ” both Aareyah said at the same time to save themselves each but smiled sheepishly realising that this won’t. ” Should not you both be careful ? What if you both fall down? And why did you left mamma’s hand ? “ Kunj said a little sternly concerned of their safety. ” Sorry Papa “ Aareyah said cutely holding their ears with Innocent cute faces which made Kunj smile at the end. By now twinkle also reached them while Maya was standing stunned witnessing the scene infront of her. He even had two daughter’s ? Maya was shocked cause practically only few people closest to him or whom he trusted knew about his personal life and family. Many people in office knew about his marriage but practically cause they were working from quite sometime and trust worthy but as maya was a new intern and joined just now she was unaware of this. Twinkle reached near them and said ” God Kunj ! Where were you ? Don’t you know how impatient your daughter’s are ? ” Twinkle was facing her back to Maya as when she approached Kunj , Maya was still in shock to see the woman. Maya looked at twinkle’s back and was curious to see the woman. After all who was the woman that snatched her dreams away from her long back. ” Areh…I was coming only when…..*pause* Meet her…Maya Khanna , New intern in my office….. I bumped into her ” Kunj said making twinkle look at the woman standing behind her and smiled at her awkwardly as she caught Maya gawking at her husband which made her lil conscious. ” Maya…..meet my wife Mrs Twinkle Kunj Sarna ” Kunj introduced twinkle to Maya with a smile pulling twinkle closer to him by her waist while Aareyah still looked at them confused. Maya was still in shock under the impression of him being unmarried she practically dreamed of her life as his wife and all the luxuries she could have and the benefit of advancing in her career without hardship but now this illusion was broken by a small rock hitting at her dreams shattering it like mirror into thousand pieces. Maya barely nodded her head in yes and managed to fake a smile. She fisted her hand’s in anger and kept staring Kunj continuously with weird emotions but Kunj was to busy with Aareyah to notice that. But twinkle did noticed that and felt possessive and angered. So she tightened her hold onto Kunj’s arm making him look at her in confusion. ” Let’s go Kunj. Reyah and Aarohi must be hungry. Right babies ? ” twinkle said at last questioning Aareyah who immediately nodded their head in yes. Twinkle thanked her daughter’s in her head that they didn’t denied her in their innocence. She wasn’t liking the way Maya was checking out Kunj or say she was jealous though Kunj payed no heed to Maya. Twinkle still didn’t liked her presence around them. It gave her negative vibes. Their ordered their meals and their lunch was soon served to them. They ate their lunch with Aareyah continuously taking while with Kunj replying and feeding them while twinkle was in grumpy mood speaking rarely. Soon after finishing their Lunch twinj along Aareyah drove for their house but Unknown to them Maya witnessed everything sitting in her car. She tightened her hold on steering wheel and with anger drove toward’s a mansion. She need to see THEM now. How dare they play with her ? Soon Twinj reached their Villa , guards opened the door. Aareyah got of from car and ran toward’s the puppy house they specifically asked Kunj to got for their little puppy. While twinkle went inside the house. Kunj after gesturing bodyguards to keep eye on Aareyah followed twinkle behind. ” Huh buddhu Sarna. Can’t he see that idiot woman was continuously gawking him. Why he have to be so stupid babaji. Why babaji ? Why everyone have to stare my man only ? “ twinkle continued muttering angrily remembering how Maya was gawking him and many other woman in restaurant. Twinkle increased her pace but Kunj quickly followed her. As twinkle was walking ahead still muttering curses under her breath she felt herself being lift into air and see Kunj holding her in his arms in bridal style. She glared at him and struggled to come out of his arms but failed. ” Leave me Kunj. ” twinkle said still struggling in his embrace. ” Twinkleeeeeeeee……….What happened to you ? Why are you this angry ” Kunj asked twinkle confused. She was still in his arms. ” It’s all cause of you Mr Sarna. Now put me down “ twinkle replied angrily glaring Kunj. He kept her down but caged her between his arms. ” But what did I do ? “ Kunj asked still confused. ” As if you don’t know Mr Sarna “ twinkle said and pushed him coming out of his arms and walked toward’s their room upstairs. ” But I really don’t know what did I do “ Kunj muttered with a pout to himself and followed twinkle behind. Twinkle was standing infront of the mirror angrily removing her jewellery huffing. Kunj closed and locked their room door behind and cleared his thought to gain twinkle’s attention but all he received was an angry glare from twinkle. ” Uh…..Twinkle what did I do atleast tell me ? “ Kunj asked. Twinkle stood from the dressing stool and moved toward’s Kunj with a funny glaring eyes who moved backward. Soon his legs hit the edge of their bed and Kunj along twinkle fell on bed with twinkle hovering upon him , her hair’s covering his face. Kunj raised his hand and tucked her hairs behind her ear and intensely looked into her eye’s. They were busy gazing eachother. ” Will you now tell me what did I do ? And what are you so angry about ? ” Kunj asked. ” Why you have to be so hot ? “ twinkle blurted angrily. ” Can’t you realise Mr Kunj Sarna that your so called new intern was practically gawking you like an eagle who would pounce on her prey any moment “ twinkle said while Kunj understood that his siyappa queen was jealous and started laughing loudly making twinkle more grumpy. ” Why are you laughing ? “ twinkle asked while squinting her eye’s. Kunj rolled twinkle taking her beneath him still giggling and said ” You are jealous siyappa queen. You look so cute with this possessive angry face ” kunj pulled her nose to which twinkle pushed away his hand. Kunj was still laughing at her cuteness when twinkle pulled him completely on her and smashed her lips against his in a fierce kiss shocking him. Twinkle kissed him passionately with possiveness. Kunj kissed her back with same intensity during kiss twinkle again pushed Kunj of her and hovered over him without breaking their kiss. They were so invaded in eachothers passion that they forget about their surroundings , Kunj pulled twinkle more closer to him , they were snuggled against eachother as a jigsaw puzzle , his hands made their way to her waist and caressed her ever so slightly and sensually making her moan between the kiss. They pulled out of the kiss breathing heavily and rested their foreheads against eachother. Twinkle nuzzled Kunj’s neck and started placing wet kisses on his neck. Kunj moaned with pleasure and sat up straight with twinkle’s legs parted on his either side of waist. Twinkle pulled of Kunj’s coat and throwed it away. Twinkle pulled Kunj’s shirt over his head as she wanted more access to his bare skin soon Kunj’s shirt was lying on floor along twinkle’s and his coat. They kissed eachother passionately once again. Kunj’s hand travelled twinkle’s back and he pulled the zip of her dress down while twinkle’s hand roam on expense of his bare upper body and abs. Kunj rolled over taking twinkle beneath him and broke the kiss. He kissed her neck pulling down her dress along his fierce kisses. He kissed her jaw line and bit her there igniting a moan from her and sucked that place to sooth the pain leaving behind his mark. Within a while their clothes were discarded of by eachother and thrown on to floor as they once again marks eachother as theirs. Their bodies marked with red love bites and hickies. Their souls were once again intertwined to pure bond of love. He placed a kiss on her forehead to calm and comfort her as he makes love to her and increases his pace making her scream with pleasure. Soon they were drowned into their pleasurable world. A rough encounter was followed with their moans and groans , their breaths mingled as their bodies. Maya stopped the car infront of Sarna Mansion and walked inside with anger blazing in each fibre of her body. She angrily pushed open the door of Sarna Mansion shocking Manohar and Usha who were enjoying their tea. They were stunned seeing Maya here but what shocked them was Maya angrily glaring at them. ” Maya Beta , you here ? “ Usha asked. ” What are you talking about Maya ? “ Manohar asked though he somewhere knew what she was talking about. ” You blo*dy lied to me about Kunj. You said he was just in Love with some b*t*h who is behind his fame and money but He is married and actually have two daughter’s with that woman ? ” Maya shouted angrily at them. She huffed in anger and ran fingers through her hairs. Maya is daughter of Usha’s friend. ” Ma..maya actually…..” Usha was interrupted by Maya. ” You lied to my mother. You lied to us that you wanted to get your son married to me and make him leave the woman who has trapped him with her talks and beauty. That was the reason my mom called me immediately after my graduation from London but here your son is married and living a happy life with his family. ” Maya shouted at them angrily. Ending was unexpected and shocking ain’t ? Will maya help them with their evil motives after knowing the truth ? Twinj romance was Hot right ? Do you liked the possessive twinkle ? What do you think is coming up next ? PRECAP : A glimpse to Kunj’s past and Twinj’s marriage. Aarohi is INJURED…. How does it happened ? What will be Kunj’s reaction ? To , Ms basher aka Ms Unknown…. Your allegations and bashing’s didn’t even affected me a bit nor did my reader’s. You said I was trying to make everyone hate twinkle by making her villian Haan. You just didn’t bashed me but also dragged another Twinj writer from Wattpad and even bashed Cheena and Sidmin78. You are also on Wattpad right ? Then come there and face me if you have guts. You claims to Love Twinj but then Why this biasedness when judging a FF where twinkle is shown wrong ? I never saw you commenting like this on any other FF or writer who shows Kunj wrong ? Liking her or ain’t is our choice but we have never defamed her cause we ourselves our girl’s and knows how to respect a woman unlike you who start personal attacking other’s when left with nothing to defend yourself. You talked about Our guts that day right ? What about you ? After creating fuss here you blocked me on Twitter and your friend’s too did that whom I didn’t even knew just so that you don’t have to face me ? You are a silent reader you said and yet you have the guts to make an argument with writer’s or bash them. Jaise tum Jasmin fan ho main bhi sidhant fan hun. Tumhe twinkle ke role bure pasand nahi mujhe Kunj ka nahi pasand. So main toh wahi likhungi jo mera dil karega aur agar itni taqleef hai toh simply ‘ DON’T READ ‘. 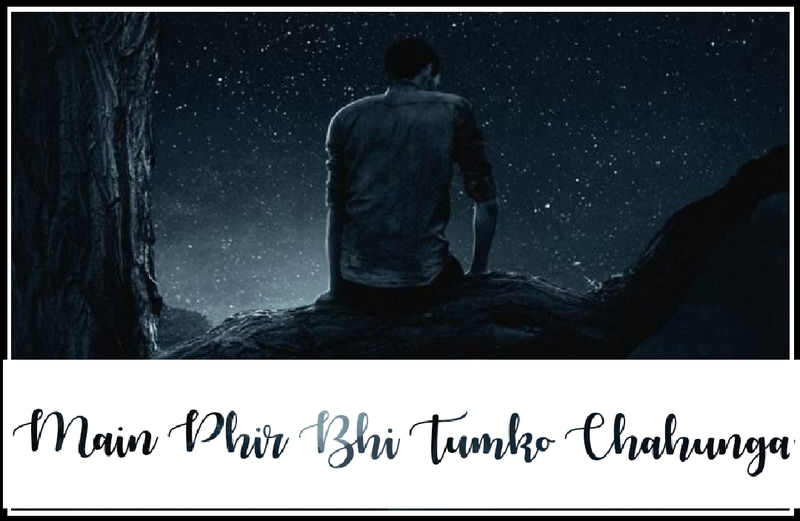 If you ain’t liking ‘ Main phir bhi tumko chahunga ‘ then you are not forced to read or comment. It’s your choice. But that was honestly needed cause that day that basher crossed her limit’s. I would soon show you all the wattpad cover of INTEQAAM or you want to see now ?